Tempt your Fate in action packed space adventures! Fate has gone through a lot of development, from the main breakthrough with Spirit of the Century to the current wave of games using Fate Core and Fate Accelerated. Bulldogs! lies in the middle of that evolution, coming out after the success of SotC, but before the birth of Core and Accelerated. Bulldogs is a space opera game, taking place in The Frontier Zone between two competing empires. Big interstellar corporations are among the movers and shakers in this region, and the players are employed by such a corporation, manning a Class D freighter carrying cargo around the frontier and encountering all sorts of mayhem. When starting a new campaign, the players and the GM create the ship and the captain together, assigning aspects to them and talking about the basis for the crew. The book stresses that the GM should have no more say in this than the other players. It also recommends that the captain be controlled by the GM, and not be a player character. Then each player will create their own characters, choosing a species from the list or making one up, devising aspects and assigning skills and stunts. Stunts work much like they do in Atomic Robo: The book comes with examples of stunts, but the idea is that you should design your own stunts. The book is neatly laid out, with clear headings and a logical structure. As a nice little touch, each chapter has an associated picture, and a circular cutting from that picture is in the top corner of every even page of that chapter. My impression: In many ways, Bulldogs! seems to be a mix of Ashen Stars and Atomic Robo. Just like Ashen Stars, you are travelling around your section of space, solving problems and having adventures. It also features a similarly varied set of alien species. But the tone is much lighter than in Ashen Stars, and more like Atomic Robo – the same ridiculous attitude and silly hijincks. The alien species would also be more at home in the zanier world of Atomic Robo than in Ashen Stars: one is a race of mad, trigger happy teddy bears, for crying out loud! Many of the others are anthropomorphic animals of different kinds, like a race of big cats, a race of humanised snakes and a race of a-sexual, cloning slugs. I suppose this goes with the more gung-ho, action oriented kind of space opera featured in this game. 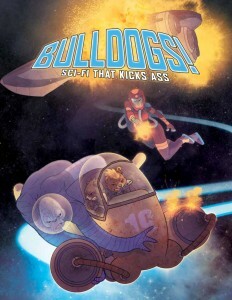 Where Ashen Stars and Atomic Robo both have a very firm description of what you will be doing, Bulldogs! has only some vague indications. You will be delivering goods, often of a dangerous and unstable kind. And then? Well, then action happens, of some unspecified kind. Th game does indicate that it might be a good idea to involve players’ aspects in the creation of scenarios, but that is about it. There is no recommended structure for a scenario, and no outline for how you should put a campaign together. This is somewhat disappointing, not least because the players’ immediate circumstance – as something akin to galactic FedEx’ers – doesn’t naturally lead to great games. To be frank, I was somewhat surprised when I saw what the basic premise for the campaign was. You are hauling stuff, which is a trade that is most successful when you just land, unload and take off again. Not what you’ll want to be doing every Wednesday night for some excitement. Now if you were freelance haulers, you’d be negotiating contracts and sometimes ending up with a deal going south. But no, you are corporate wage-slaves, getting your assignments from HQ. Granted, you are going to be transporting dangerous and volatile cargoes, but that also seems to have a limited novelty factor. At the back of the book are some alternative suggestions for campaigns that sound more interesting. You can be a mercenary crew, explorers, an espionage crew or perhaps even pirates! I am left to wonder, though, why none of these were chosen as the basic model for a campaign, or maybe just written into the chapter as equal ideas. All of these seem to more readily afford a varied series of exciting adventures. As stated before, the captain is supposed to be an npc. This doesn’t seem an obvious choice to me either. The game states that in this way, the captain can be an adversarial force who can help create problems for the players. Fair enough. But it also means taking a fair deal of agency away from the players. Unless the first part of the campaign involved getting rid of or sidelining the captain, I think I would prefer to have a player assume the role of captain. That way, it will be a player having to deal with HQ, making unpopular decisions and taking the spotlight during a tense dogfight. And I’m not worried about one player nominally having authority over the others – a bit of PvP can mean hours of fun play that the GM doesn’t have to initiate. I like the universe of Bulldogs! and the tone of the game seems fun and very appealing. Having the players and the GM make the space ship together as part of character creation is a great idea, as it makes the ship a unifying part of the party, and implies a conversation about the kind of game the group wants to play. I could easily imagine Firefly as a prototype of a campaign of Bulldogs! where the ship is like an extra character in the party. Unfortunately, the game seems unfinished, or at the very least, unpolished. To my mind, no modern roleplaying game is complete without some form of instructions in making the kind of scenarios and campaigns it wants you to play. This game provides mostly alludes to the kinds of situations that could arise, without really telling me how to put it together. The whole GM-section of the book is 9 pages out of 170, with several going to general moment-to-moment advice on running a game of Fate – much of which is practically identical to advice from the superb GM-section in Spirit of the Century – and two pages being the alternative campaign ideas. “Adventure Design” is barely half a page of vague advice. A pity they didn’t adapt some of Spirit’s excellent advice on creating adventures. I do have faith in my abilities to create an interesting campaign of Bulldogs! But with so many cool and interesting games beckoning, I’m likely to skip it for a game that provides me with more structure to create a good basis for fun and engaging games. How would I use this: If I ever wanted a fun game of rogue operators in space, in the vein of Firefly, I might very well look to Bulldogs! (I might even think this game would better emulate that series than the actual Firefly roleplaying game). I’ve said this a lot throughout this advent calendar., but it might also be a good game for young roleplayers with an experienced GM.